The Panametrics-NDT™ Model 25DL PLUS ultrasonic precision thickness gage provides cost-effective solutions in applications where the opposite side of the test material is difficult or impossible to reach. An important benefit of this handheld unit is its ability to make thickness measurements on many materials in a wide variety of shapes and sizes. A large Liquid Crystal Display displays both the live ultrasound waveform and the thickness reading. Operation of this handheld gage is intuitive with a color-coded keypad and direct-access number keys. One of the many unique features of this gage, Application Auto-Recall, allows the user to select and recall any of the stored standard or custom transducer setups in the gage's memory. This permits easy switching among our full line of contact, delay line, and immersion transducers to solve an almost infinite number of measurement problems. The 25DL's internal datalogger stores, recalls, and transmits 1,750 waveforms and more than 18,000 thickness readings along with alphanumeric Identification codes. The A-scan shows both the live waveform and the thickness reading, which is ideal for turbine blade inspections and any other application where the user needs to ensure proper transducer alignment. Mode 1: Time interval between excitation pulse and first backwall echo. Using contact transducers. Mode 2: Time interval between the first interface echo after the excitation pulse and the first backwall echo. Using delay line or immersion transducers. Mode 3: Time interval between successive backwall echoes following the first interface echo after the excitation pulse. Using delay line and immersion transducers. Thickness range depends on material, transducer, surface condition and setup selected, extended thickness ranges are possible using custom setups. Three Differential Modes: Standard and Percent: Thickness difference and percent difference between actual measurement and reference value. Rate Reduction: Display actual thickness and percent difference from setpoint. Both values can stored in the internal datalogger. Min/Max Mode: Works in conjunction with FAST Mode for rapid location of minimum or maximum thickness reading and associated waveform. Display: Liquid Crystal Display with backlight. Contrast keypad adjustable. Zoom Mode: Expands the horizontal span of the waveform to the minimum range associated with each transducer and automatically centers the measured echoes. Identify, store, recall, clear, and transmit thickness readings and gage setup information via the full duplex RS-232 Serial Port. Baud rate, word length, stop bits, and parity are adjustable from keypad. 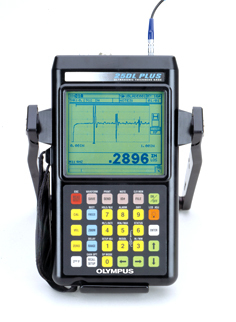 Standard: 18,000 thickness readings or 1,750 waveforms with thickness. Upgrade 1: 36,000 thickness readings or 3,400 waveforms with thickness. Upgrade 2: 54,000 thickness readings or 5,100 waveforms with thickness. 2214E" 5-Step Test Block, 1018 steel, English Units: .100", .200", .300", .400", .500"
2213E" 5-Step Test Block, Aluminum, English Units: 100", .200", .300", .400", .500"
" Test Blocks are available in metric units.